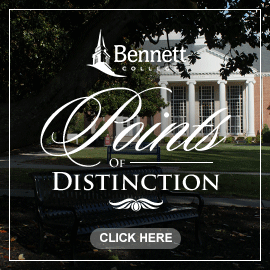 Students who have not attended Bennett College for one or more semesters and left in good academic standing (at least 2.0 cumulative grade point average) must submit an application for readmission to the Office of Enrollment Management prior to re-entry. If she has attended another college or university during her absence from Bennett College, an official transcript from the visiting college or university must be received and must be considered in evaluating the student’s readmission. The student must receive clearance to re-enroll from several areas of the College prior to an admission decision. These areas include, but may not be limited to: Academic Affairs, Student Affairs (for conduct matters), Health Center (for North Carolina immunization compliance), Financial Aid, and Business Office (for fiscal matters). 3. Send a $35.00 non-refundable, non-transferable Application for Readmission fee. Payment Options: Credit/Debit Card, certified checks or money orders made payable to Bennett College. PLEASE DO NOT SUBMIT CASH OR PERSONAL CHECKS. Note: The transcript must indicate a GPA of 2.5 or higher. 5. Dismissed Students ONLY: Submit official transcripts stating that you have completed the required credit hours with a grade of “C” or better in order to process your application.